Corruption is a worldwide phenomenon. Developing countries and those making a transition from socialism are particularly at risk. 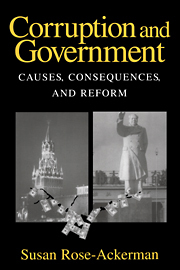 This book suggests how high levels of corruption limit investment and growth and lead to ineffective government. Corruption creates economic inefficiencies and inequities, but reforms are possible to reduce the material benefits from payoffs. Corruption is not just an economic problem, however; it is also intertwined with politics. Reform may require changes in both constitutional structures and the underlying relationship of the market and the state. Effective reform cannot occur unless both the international community and domestic political leaders support change. Preface; Introduction; 1. The costs of corruption; Part I. Corruption as an Economic Problem: 2. The economic impact of corruption; 3. Corruption of high level officials; 4. Reducing incentives and increasing costs; 5. Reform of the Civil Service; Part II. Corruption as a Cultural Problem: 6. Bribes, patronage and giftgiving; Part III. Corruption as a Political Problem; 7. Corruption and politics; 8. Democracy and corruption: incentives and reforms; 9. Controlling political power; Part IV. Achieving Reform: 10. The role of the international community; 11. Domestic conditions for reform; Conclusions.